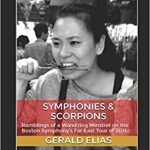 SYMPHONIES & SCORPIONS, by Gerald Elias. Music is a universal language. It transcends international boundaries and language barriers. It doesn’t matter where you live, you can be moved by the exact same piece of music, whether it’s a Beethoven symphony with its dramatically powerful themes or a symphony by Tchaikovsky with its romantically soaring melodies. Their appeal knows no artificially imposed limitations. And this is one of the premises in Gerald Elias’ new book, Symphonies & Scorpions. It’s a memoire of the Boston Symphony Orchestra’s tour to China and Japan in 2014 with the (now disgraced) conductor Charles Dutoit. It also juxtaposes that tour with the one the BSO undertook to China in 1979 with its music director Seiji Ozawa, not long after the United States and China normalized relations. Elias joined the BSO in 1975 and remained there until he became the Utah Symphony’s associate concertmaster in 1988. But he never severed his ties with Boston and continues his association with that orchestra as a substitute player to this day. He was a member of the BSO for both tours and this, consequently, gives him a distinctive perspective and affords him a wonderfully lucid and insightful glimpse into that historic tour in ’79 and how it contrasted with the BSO’s ’14 tour. Elias writes in a relaxed style that makes this short book easy to read and quite enjoyable. Instead of telling his story chronologically, or dividing it into chapters, Elias breaks it up into short sections that read as vignettes. It’s as if he was jotting down ideas as they came to him. It gives the book an immediacy that is appealing and makes it hard to put down. He does discuss what it’s like taking a hundred people with their luggage and instruments overseas and dealing with the hassles of traveling great distances and through numerous time zones and how difficult it can be to be fresh and rested before dress rehearsals and concerts. But it’s not boring; Elias has the ability to draw the reader in and make you feel as if you’re part of the tour. What is particularly fascinating is how Elias describes the differences in the China of 1979, a country that was still reeling from the devastating effects of Mao’s Cultural Revolution, and today’s modern, smog filled China. Much has changed in the country in the intervening three and a half decades, much of it for the better. But there is still a lot that remains to be done. What hasn’t changed in the intervening years is the Chinese people’s love for Western classical music. Response to the BSO’s concerts, including some that also had members of a Chinese orchestra playing together with them, was overwhelming in 1979. And the response was no less enthusiastic in 2014. And with ticket prices on the 2014 tour rivaling those in Boston or New York City, the halls were nevertheless filled to capacity. On their way home the orchestra stopped in Tokyo for a couple of concerts, which were also warmly received. All in all, Symphonies & Scorpions is a captivating book that has so much to offer. As to the meaning of the title, well, you’ll just have to read it to find out. The book is available as an ebook and as a paperback through Amazon. Utah Cultural Alliance has just released its latest State of UT Culture Report and Cultural Asset Map. The Utah Cultural Alliance (UCA) – the statewide ambassador for the arts, humanities and cultural sector of Utah – has collected data from the past year that measures the economic impact of cultural businesses within Utah. This data is compiled into their second annual State of Utah Cultural Report. Cultural businesses analyzed in the report include nonprofit organizations as well as for-profit businesses such as galleries, graphic design firms, interior designers, filmmakers, photography studios, along with individual artists, many of whom are independent contractors. These stats demonstrate that cultural businesses are indeed economic drivers for Utah. They attract and develop businesses, create and support jobs, increase tourism, and generate revenue for state government. Along with boosting the economic vitality of the state, cultural businesses also make it a great place to live and work by adding to the health, vibrancy, quality, and diversity of Utah’s cultural community. For more information visit http://www.utahculturalalliance.org/stats for the full report. It highlights a number of counties and organizations. Utah Cultural Alliance recently presented this report at the legislature in a committee meeting of the Business, Economic Development, and Labor Appropriations Sub-committee. Related to the State of Utah Culture report, Utah Cultural Alliance recently released a new tool, the Cultural Asset Map. Located at www.utculture.org/map, this tool is a visual representation of Utah’s cultural sector. This tool is fun to explore but also useful for planning vacations, road trips, and boosting tourism. There are currently around 300+ pins and continues to grow. The Utah Cultural Alliance (UCA) is the unified statewide voice and support organization for the cultural community. UCA is membership-driven organization that includes museums (arts, history, science, botanical gardens, and zoos), universities, archives, libraries, artists, patrons, as well as arts, folk arts, cultural, humanities, science, education, preservation, history, and heritage organizations. Additionally, businesses, corporations, and foundations belong to UCA to support the continuing viability and visibility of Utah’s cultural community.